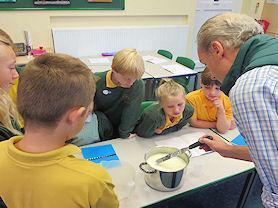 Mr Skailes (Jack and Hugo's dad) came in to talk to Base 3 about making Stilton. We learnt about the important ingredients and how they are put together to make this very famous cheese. He showed us pictures of the Cropwell Bishop Creamery and we got to taste three of the cheeses that he produces. Very many thanks to Mr Skailes for an excellent start to our Thursday!